And we're back. It's been a while, almost a year. And the focus (if there was one) has changed. Aside from random musings, and as the late George Carlin would call them "Brain Droppings", I'm attempting to feature what we've bought or what we're bringing for this coming Sunday at the Sunday Antique Market at St Lawrence Market. Today, a vintage leather jacket. Pre-distressed on your behalf. And boy is it distressed. But a great look and a small size, probably a 34 men's, but most likely would look best on a woman. 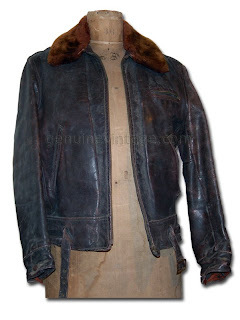 Sheepskin lined and with a mouton collar, this jacket was probably made in the thirties, by Univer...? From the remnants of the label inside it looks like "University Leathers". As I said it's in pretty rough shape, but what a great look.